The Turandot Restaurant is an establishment beyond the scope of definition �restaurant�, it�s a true luxury palace, all the interiors of which are hand-made. Tinsel, antiques, the majestic chandelier of Malaysian crystal with unique lightning, acting fireplaces, tapestries � and everything is genuine! The detailed interior took 6 years of constant planning with two workshops of wood-carvers, artists, sculptors working at them without a break. Under a huge tree of bronze there�s a turning podium where an orchestra can play gentle background music. Above it all there�s a mechanical peacock able to whirl and to flop, a grotesque hi-tech copy of the Hermitage statue in St. Petersburg. The Asian themed menu was created by Hakkasan and Wagamama�s Alan Yau, the only chef awarded two Michelin stars for the Asian cuisine. He offers a wide range of Chinese and Japanese dishes including gentle ostrich fillet in bean sauce, Meru fish fillet with a sour-sweet sauce, Pekinese duck with beluga caviar and mango and crab salad. All the dishes are so excellent that gourmands are at a constant loss as to what to go for. Pay particular attention to the dessert menu Ice-cream and sorbets are from the renowned Cafe Pushkin, while the rest of the deserts are all Yau�s creations; roll of chocolate-cigarette pastry with chocolate and pistachio creme brulee with vanilla �Bourbon� and hot lemon gratin with wild strawberry. 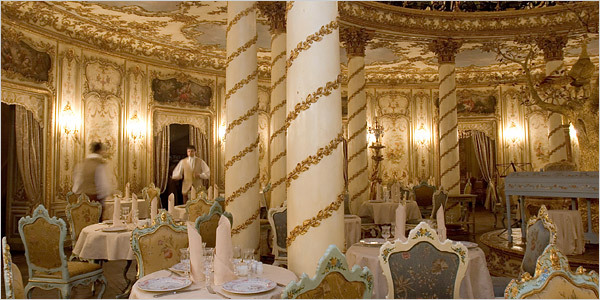 A dining room truly fit for a Romanov.